If you have not heard, Lee Kuan Yew died this past week on March 23, 2015. And if you don’t know who he is, Lee Kuan Yew is the first Prime Minister of Singapore and the man chiefly responsible for what Singapore is today. I have lived in Singapore for the past 12 years and here’s the deal: it’s safe here for everyone; it’s clean; efficient – everything works; no corruption; very little traffic; emphasis on education; continual uplifting. I love living here. I chew gum; I have freedom of speech; I respect others and others respect me. Lee Kuan Yew envisioned this possibility and had the determination, perseverance and will to get it done. His views reflected his beliefs and his actions delivered on the promises he made to his country: stability, economic growth, jobs, a thriving metropolis, education for all, and harmony between all races and religions. To say Lee Kuan Yee was a “great man” is the truth. The scope of his insights, his policies and the resulting product went beyond Singapore during his tenure as the country’s founding Prime Minister. His influence and intellect inspired global leaders till the day he died and will have a profound positive effect on future generations throughout the world. I urge you to read more about him: his history and more importantly, his views. Just google “Lee Kuan Yew” or visit http://www.rememberingleekuanyew.sg/ and you will find ample reading. Also feel free to share this with your friends and family. I consider myself somewhat of a “t-shirt expert”. Based on my own not-so-very-scientific research, I wear a t-shirt 364 days a year: at work, at home, on weekends, on vacations, during the day, and at night. 100% cotton. Silk screened. Groovy. High quality fabric. Comfortable. The colors will not fade. If you want one, you can get one at http://www.BeamAndGo.com. It’s for sale and available in children-size, small, medium and extra-large. Delivery within the Philippines is free. For more pictures of people sporting The BeamAndGo T-Shirt look for #iwearbngtshirts on Instagram. Also feel free to share with your friends. To see what else we are doing at BeamAndGo, visit us at http://www.beamandgo.com. And if you have questions, suggestions or comments, you can contact me directly at jonathan.chua@beamandgo.com. We recommend the “to ZAP” option. Because BeamAndGo has just partnered with the ZAP Group to provide you and your family with restaurant, entertainment and branded apparel options in the Philippines. At BeamAndGo, our focus is to provide you with a better way to purchase the essentials – groceries, medicine, healthcare, etc – for your family. And now, every time you make a purchase at BeamAndGo, ZAP will reward you with points that can be redeemed at any ZAP participating merchant, like Red Mango, Banana Leaf, and Converse … the fun stuff (the full list of stores). For every PHP 1000 worth of digital gift certificates you purchase on BeamAndGo.com, you or your family in the Philippines will receive 5 ZAP points. The more you purchase from BeamAndGo, the more ZAP points you will receive. 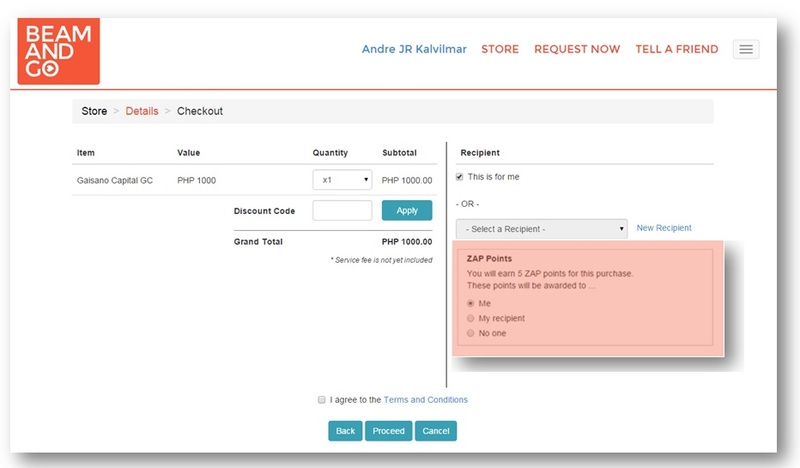 When you make a purchase on BeamAndGo.com, you can select who will receive the ZAP points. If you live in the Philippines, you can even select yourself. All you or your family needs is a Philippines-based mobile phone number. The ZAP points will then be sent to the selected person’s mobile phone within 7 business days. No forms to fill out. No registration process. Can’t be any simpler than this. Give it a try and tell use what you think. And feel free to share with your friends and family. Does your family live in Cebu? I previously thought that the last time I was in Cebu was in 2005, but it was longer than that … it was 1996 (almost 20 years ago!). What I do remember clearly was that the beaches were awesome, the city was clean and well organized, duck pin bowling was mucho fun, and I met a lot of friendly Cebuanos during my visit. So I am happy to say that we have a bunch of merchants on the BeamAndGo platform with branches in Cebu. Gaisano Capital is one of the premier department stores in the Philippines. They are known for their wide selection of merchandise and affordable prices. In Cebu alone, they have 8 branches. With 5 branches in Cebu, Prince Warehouse is one of the fastest growing hypermarts in the Philippines. They have a wide selection of groceries and supplies with discount specials every week and sometimes daily. Generika is the #1 generics drugstore in the Philippines with 32 branches in Cebu. They carry affordable generic medication, branded medicines, hospital supplies and perform health screenings. Also feel free to share with your family and friends. I just saw the latest remittances figures in 2014 for overseas Filipinos. US $24.3 billion. That is a 5.8% increase over 2013. Sounds great, right? 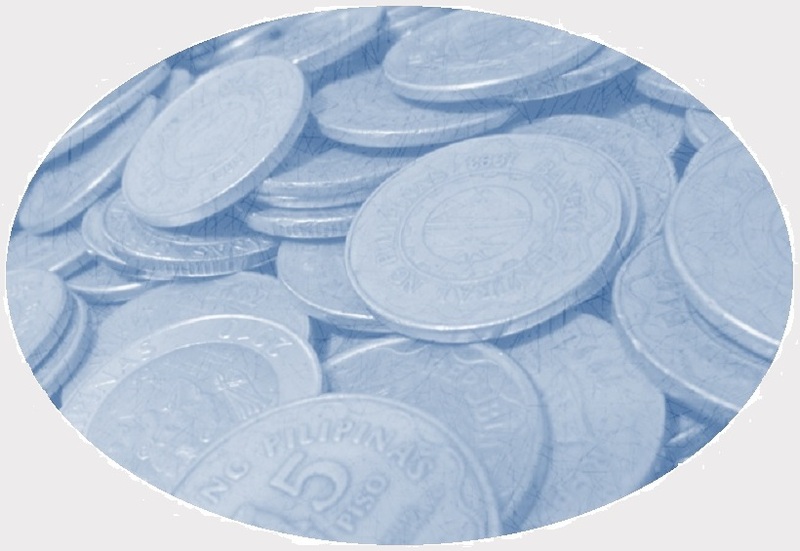 It would be, if the money was spent on the essentials and used to help recipient families gain financial stabilty. I don’t know the whole story and there are usually two sides to every story. 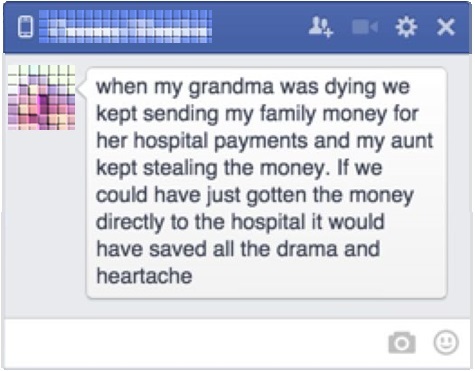 But this is a tale with a common refrain: overseas Filipino sends money back home and the money then disappears. Sometimes the money is used for self-profit; sometimes gambling; sometimes drugs and alcohol. In these cases, the end result is that the provider’s hard work is wasted and the whole family ends up no better than before. Millions of Filipinos go overseas to work not expecting this to happen, but it happens all the time. Cash is the most flexible form of payment in the world. And in the Philippines, cash is accepted everywhere. So cash is great when used properly. But is it really the best way to provide for one’s family needs? There is no control on what it is used for, no accountability, no transparency. When we started BeamAndGo nine months ago, we wanted to attack this problem. We wanted the hard working Filipinos around the world to have control over their hard earned money AND still be good providers for their families in the Philippines. At BeamAndGo, we believe there is a better way for people to support their loved ones in the Philippines other than just sending cash. Our goal is to enable providers to buy food, medicine, health care, insurance, education and other essentials for their family in a way that is affordable, convenient, transparent and sustainable. If you like this article, please share with your friends and loved ones. To see what we are doing at BeamAndGo, visit us at http://www.beamandgo.com. Also, I am always looking for ways to make BeamAndGo better, so if you have suggestions or comments, you can contact me directly at jonathan.chua@beamandgo.com.